Example-1 :- Consider the following information regarding the number of men and women workers in three factories I, II and III Represent the above information in the form of a 3 × 2 matrix. What does the entry in the third row and second column represent? The entry in the third row and second column represents the number of women workers in factory III. 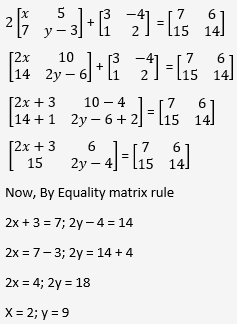 Example-2 :- If a matrix has 8 elements, what are the possible orders it can have? We know that if a matrix is of order m × n, it has mn elements. 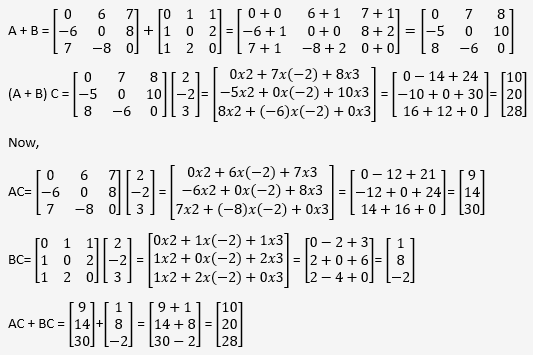 we will find all ordered pairs of natural numbers, whose product is 8. 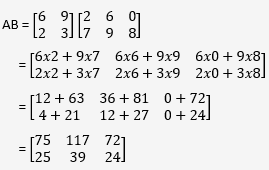 Hence, possible orders are 1 × 8, 8 × 1, 4 × 2, 2 × 4. 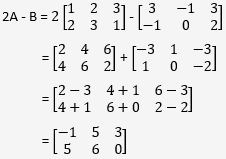 Example-3 :- Construct a 3 × 2 matrix whose elements are given by aᵢⱼ = 1/2|i - 3j|. Example-4 :- Find the values of a, b, c, x, y and z. As the given matrices are equal, therefore, their corresponding elements must be equal. 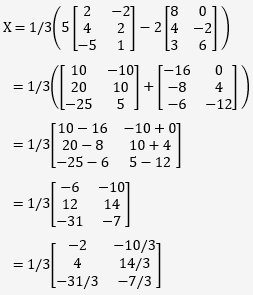 Example-6 :- Given Find A + B. 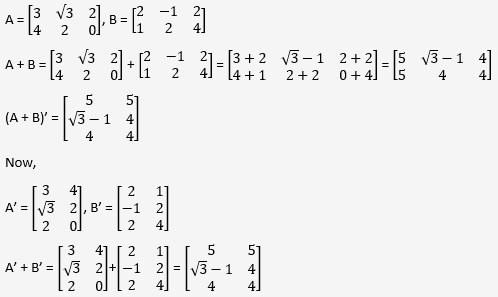 Since A, B are of the same order 2 × 3. 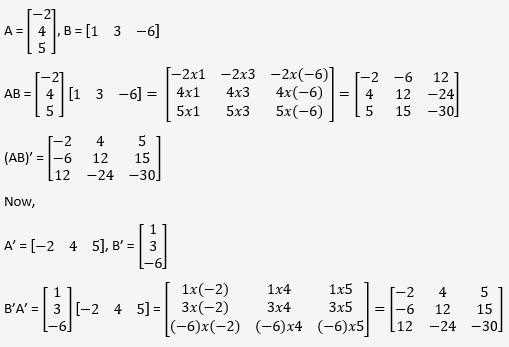 Example-7 :- then find 2A - B.
Example-8 :- then find the matrices of X, such that 2A + 3X = 5B. Example-11 :- Two farmers Ramkishan and Gurcharan Singh cultivates only three varieties of rice namely Basmati, Permal and Naura. 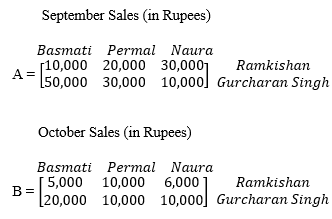 The sale (in Rupees) of these varieties of rice by both the farmers in the month of September and October are given by the following matrices A and B. (i) Find the combined sales in September and October for each farmer in each variety. (ii) Find the decrease in sales from September to October. (iii) If both farmers receive 2% profit on gross sales, compute the profit for each farmer and for each variety sold in October. and Grucharan Singh receives profit of ₹ 400, ₹ 200 and ₹ 200 in the sale of each variety of rice, respectively. 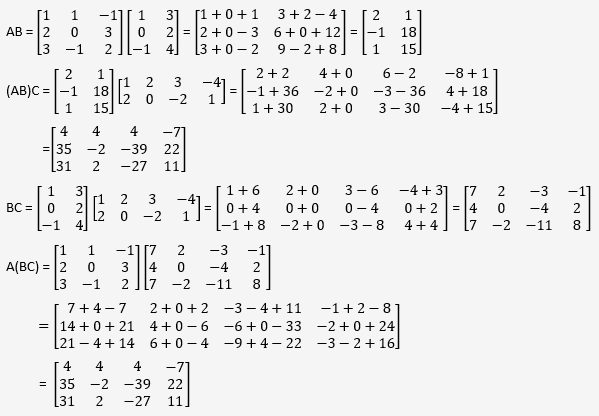 The matrix A has 2 columns which is equal to the number of rows of B.
Example-13 :- then find AB, BA. Show that AB ≠ BA. 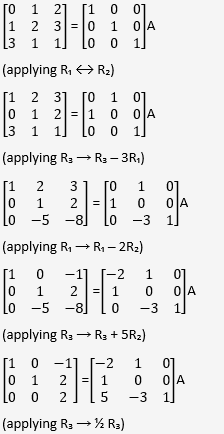 Since A is a 2 × 3 matrix and B is 3 × 2 matrix. 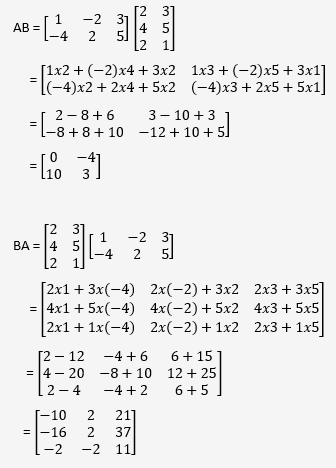 Hence AB and BA are both defined and are matrices of order 2 × 2 and 3 × 3, respectively. 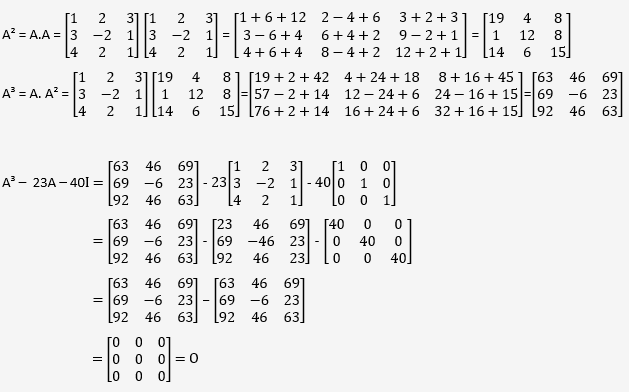 Thus matrix multiplication is not commutative. 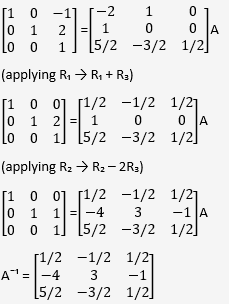 Thus, if the product of two matrices is a zero matrix, it is not necessary that one of the matrices is a zero matrix. Example-16 :- Find A(BC), (AB)C and show that (AB)C = A(BC). Example-17 :- Calculate AC, BC and (A + B)C. Also, verify that (A + B)C = AC + BC. Example-19 :- In a legislative assembly election, a political group hired a public relations firm to promote its candidate in three ways: telephone, house calls, and letters. 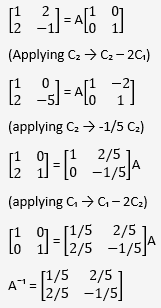 The cost per contact (in paise) is given in matrix A as The number of contacts of each type made in two cities X and Y is given by Find the total amount spent by the group in the two cities X and Y. i.e., ₹ 3400 and ₹ 7200, respectively. (iii) (kB)′ = kB′, where k is any constant. 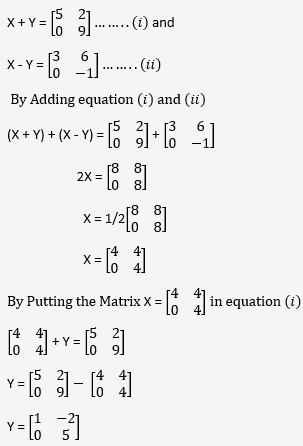 Example-22 :- Express the matrix as the sum of a symmetric and a skew symmetric matrix. 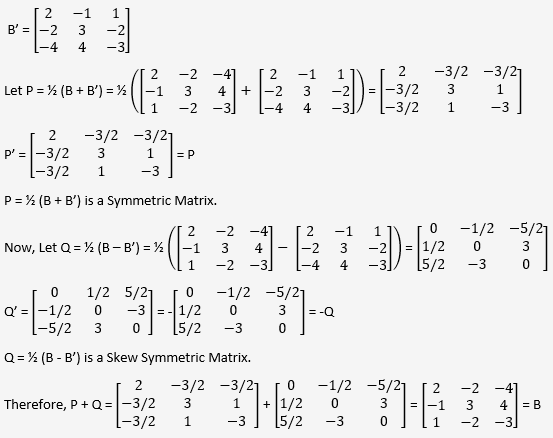 Thus, B is represented as the sum of a symmetric and a skew symmetric matrix. 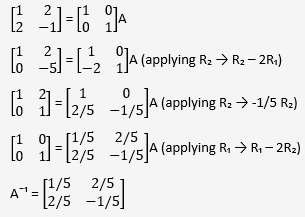 In order to use elementary row operations we may write A = IA. In order to use elementary column operations we may write A = AI. 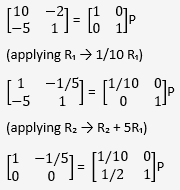 In order to use elementary row operations we may write P = IP. We have all zeros in the second row of the left hand side matrix of the above equation. Therefore, P-1 does not exist.